In the Madcap world of Flare (yes, I promise never to say that again), you can use stylesheets to give your tech docs a real edge. For me, styles are one of the hidden secrets in Flare. So, if you plan to publish your tech docs to PDF, Web, or HTML5, a crash course in CSS styles is maybe what you need. The nice thing about Madcap Flare is that you can control the design and layout with style sheets. The ‘not so nice’ thing is that the UI takes a bit of getting used to. Once you understand how it works, it’ll be fine. So, how do you start playing around with style sheets and jazzing up your online help? You can change the colour, fonts, and layout of your online help (and printed documents), use the Stylesheet Editor. Go to Content Explorer, Resources, Stylesheets. 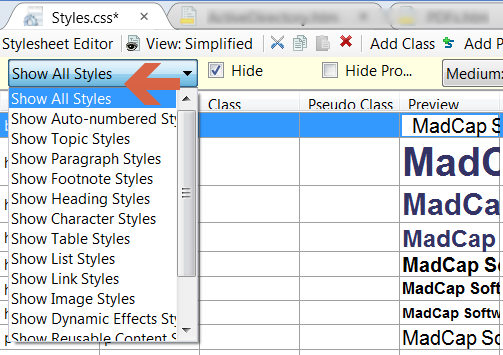 Right-click or double-click on the style sheet to open the Stylesheet Editor. NB: If the list of styles is overwhelming, click Hide. This tidies things up and makes it easier to use. By default, Show all Styles is displayed. If you click on the drop-down menu, you can select the Table, Images, or Headings This helps if you just want to work on a specific style family. Medium means the output type, such as HTML5, PDF or Print. Click on the Medium drop-down menu, and select the output type you want to modify. Pay attention to this as you don’t want to change the wrong CSS settings. Click this drop-down menu to view the properties alphabetically, by property groups, or other settings. Click View Advanced to switch back to the View Simplified. Let me know if you run into any problems with your stylesheets. Sometimes one small setting can throw everything out of kilter. Are we friends on Facebook? If not, jump over here.